Fly to Barcelona from Dublin and enjoy a break in an energetic beach -lined city. Choose from endless festivals, cultural attractions and a renowned nightlife to rival any European location. 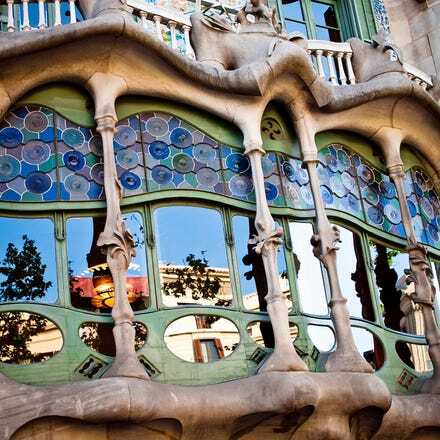 Marvel at the architectural works of Gaudi or follow a tapas trail to sample the region's culinary delights. Relax on the beachfront and take a dip in the Mediterranean. Book flights from Dublin to Barcelona with Aer Lingus and discover all that the Catalonian capital has to offer. Fanciful architecture and hip restaurants have come together with the sunny southern Spanish climate and beaches. This has transformed Barcelona in just a few decades from a rough port city to one of Europe's if not the world's premier destinations. Stroll along La Rambla, admire the Casa Calvet's façade or the Casa Mila designed by Gaudi, visit the Market of la Boqueria or shop at El Corte Inglés, and sample some of the many bars, cafés and late night haunts while you're at it. TheAeropuerto de Barcelona (BCN) is located around eight miles from the centre of the capital, so it’s not hard to get to the city. You can catch an Aerobus every five minutes from both terminals. The bus stops at several popular spots in the centre, including Plaza Espanya and Plaza Universidad. The journey to the centre takes around 25 minutes. If you’d prefer to catch the train, the station is right next to terminal 2 (if you land in terminal 1, you can hop on a free shuttle bus). Trains to Barcelona's Sants station take around thirty minutes. If you’d prefer to take a taxi, head to one of the taxi ranks outside the terminals. Once you’re in the city, you can hail a black and yellow taxi from the street, or simply head to the nearest station. Alternatively, you could call a taxi. FYI, fares tend to be a little higher on the weekend. Barcelona is a huge city and a major tourist destination. As such, it boasts efficient, well-designed public transportation. You can buy underground and tram tickets (valid for one trip) from stations as well as travel information booths, and bus tickets can be bought from the driver. If you’re planning on travelling a lot, you can choose from several travel cards.